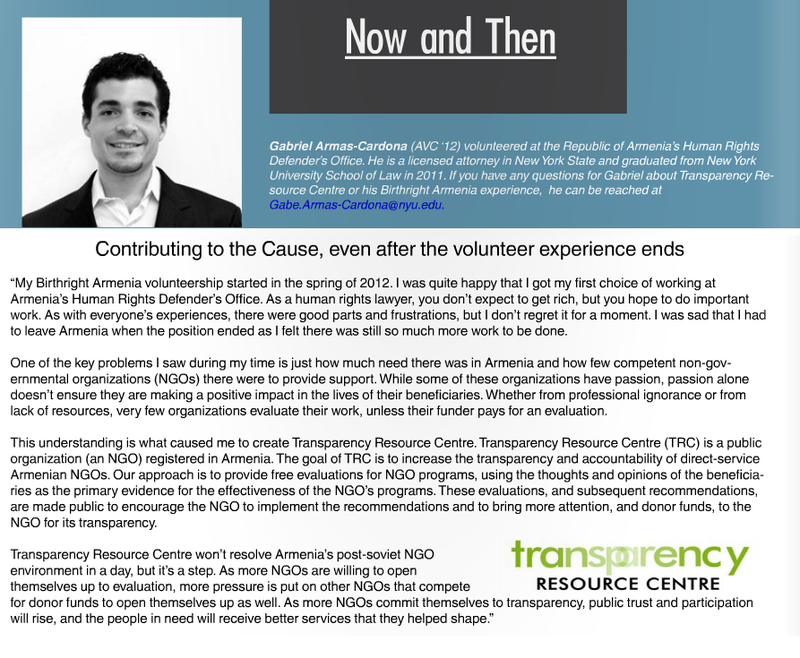 Corruption is a well-known long-term problem in Armenia. While Armenia has been making incremental improvements, the amount of blatant nepotism, especially in the regions, is astonishing. Hetq recently publicized multiple instances of no-bid contracts being given to family members of the people in power. This obvious conflict of interest is exactly what Armenia needs to fight against. Small town mayor’s company wins 29 million AMD contract. His explanation for his victory: “[The future office building] is ours. You don’t expect someone from the outside, say from Vardenis, to come here and build it.” Note: Vardenis is the closest city, 60 kilometers from the town. In yet another setback, the police have not investigated another small town mayor six months after Hetq reported on the 1.2 million AMD spent on gas on a car that doesn’t run, among other petty embezzlements. The media can only do so much, it’s up to the police and prosecutors to act to stop this blatant corruption. To zero fanfare, the Minister of Defense just ended one of Armenia’s long-standing formal discriminations: women can now apply to military schools. The lack of analysis or discussion stuns me as an American, something like this would have occurred only after significant public discourse in the US. Here, it seems like it’s just a side note. My guess is this change occurred through the need for more soldiers, thus the title of this post. While the Government is saying that it’s simply part of education reform. If it was purely educational reform, then why was it announced by the Minister of Defense? I was having a discussion with my friend who asked me about the importance of historical and political recognition of the Armenian genocide. “Should people want governments around the world making official statements acknowledging the intentional destruction done by the Athenians during the Peloponnesian Wars?” The difference between the Armenian Genocide and ancient destruction is that there are still victims of the former and their healing is stunted by the active denial of the Genocide. The reason that the Armenian Genocide matters in modern-day politics is 1) recognizing genocide helps the victims and possible future victims and 2) because the government of Turkey and certain sectors of the Turkish community actively work to silence or punish those that raise the issue. Recognition helps make any victims whole, whether genocide victims or victims of any other massive crime. When (the lack of) law cannot provide compensation, at least recognition acknowledges to the victims that the world knows they have suffered and provides some solace. Recognition can also help limit the creation of future genocides as the famous Hitler quote of “Who, after all, speaks to-day of the annihilation of the Armenians?” implies. To engage in human rights is to take a victim-centered approach—to empower those that have been disempowered—and to learn what the victim wants and needs. If the victims want recognition, then it’s not a dismissible idea. Considering the stream of people passing my window to go to the Genocide Memorial, expected at many hundreds of thousands of people today, the Armenian people have made their desire clear. Feelings of solace and peace are difficult to obtain when some people deny the existence of the genocide and actively attempt to persuade others to their side. The primary culprit here is the Government of Turkey, which has long denied the Genocide. Turkey has pressured Canada to essentially “unrecognize” the Genocide and has frozen all political ties with France when it almost passed a law criminalizing genocide denial. It’s because of Turkey that US Presidents are unwilling to use the word Genocide, even when they accept all events as true. It’s clear that denial of the Genocide is a key part of Turkey’s foreign policy. Recognition wouldn’t be painful for Turkey, just dangerous for its political leaders. Some people think that Turkey should compensate Armenians like Germany does for the Jews, but with almost no relevant international law on the subject in 1915, no one could force Turkey to provide compensation except for property that was taken from Armenians in violation of Turkey’s domestic law. Recognition would actually ease the pressure Turkey gets from many countries and would allow them to redirect a lot of their diplomatic resources. The only pain would be for the leaders from hard-line elements that flatly reject the Genocide. Unfortunately, fanatical people are the result of a biased history education, so they’ll have to be challenged at one point or another. Fortunately, there are people working on how to resolve this issue as smoothly as possible. What can non-Armenians and non-Turks do about this situation? Recognize the Genocide as a genocide, regardless of the threats and accusations hurled at them by genocide deniers. That is the way to do justice to the countless victims of history. 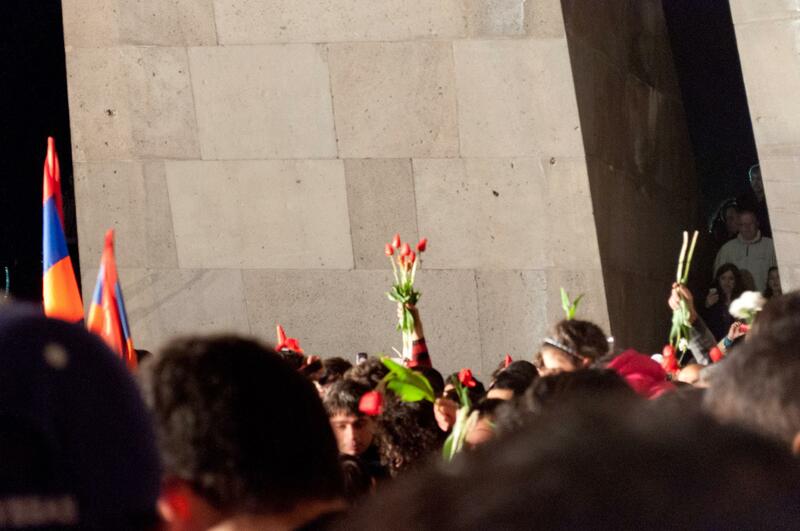 Placing Flowers at the Genocide Memorial during the candle-lit march on the night of 23 April. These institutions can form the bedrock for future change. These popular institutions can provide both the manpower and the skillset to do something big. Want to run for mayor in Yerevan? Fine, tap into this network to get hundreds of volunteers to pass out leaflets or go canvassing. Want to stop a polluting mining operation? Great, brainstorm with the intellectuals and elites to develop a strategy to force them to change their operations. Raffi was able to show that there are tens of thousands that will support and contribute to a strategy of change. Unfortunately, he never developed that strategy. Developing the long-term strategy is hard but absolutely necessary. Unfortunately, a long-term strategy needs hope and commitment. Two things that too many hayastanci lack. Instead, too many of them are waiting for a leader to solve the country’s problems, while also waiting for a green card. One great example from America’s history is the National Association for the Advancement of Colored People’s (NAACP’s) strategy to combat racial segregation in education. Racial segregation in education was legal in the US and the NAACP was able to make it formally illegal in the landmark case of Brown v. Board of Education. But, this case was only the latest in a long chain of victories. The NAACP knew that with a prejudicial Supreme Court, there was no hope to try for a grand victory, so they started with the smallest and least objectionable issue they could find. They argued that Missouri was violating black students’ rights by not having a single law school for blacks within its borders, and they won. They then argued that black law students deserved access to equally good law libraries and law professors, and they won. The NAACP correctly counted on the Supreme Court being more interested in the study of law than on perpetuating segregation. Finally, the NAACP could go after its big goal of general educational segregation in Brown v. Board and the Supreme Court had to rule in its favor because of the precedents of equality it had created for itself. This victory didn’t completely solve America’s racial segregation problem, but it was a huge step in the right direction. Barevolution as a popular movement signified by rallies is over; barevolution as a demand for change is doing just fine. The question for Armenians is what is your strategy to improve the country?